This is the scene set for guests as they enter the Walt Disney Theatre on the Disney Dream to watch the new stage production of “Beauty and the Beast.” This production, premiering in November 2017, is based off of the live-action movie, starring Emma Watson and Dan Stevens. While this show pays homage to, it is in no way a staging of the cartoon. In fact, there is hardly anything cartoony about this production. 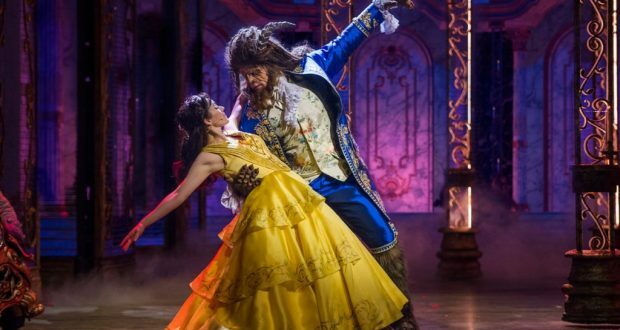 Disney Cruise Line’s “Beauty and the Beast” is most certainly a treat. Costumes: Beautiful, as always. Belle’s main costume is the same as the one Watson wore in the movie: blue dress and apron with tasteful flowers and boots. Her golden dress was classic and gorgeous too, practically shining in the spotlight. The ensemble really takes the cake for costumes, though. They must carry several different characters throughout the show, which means many costume changes. The speed and professionalism of this was so well done. Main Characters: I loved Belle and Beast’s relationship in this show. They connect with each other through books and dancing and jokes. Belle is spunkier than she is in the classic cartoon. She’s fierce and takes charge more, using quick wit and cleverness to save the day. Beast is educated and almost kind. Gaston was pretty much exact to the cartoon/live-action. Very macho and arrogant, the perfect bad guy combo. Lefou seemed to be trying to be Josh Gad, rather than Lefou, but that’s just my opinion. Enchanted Characters: In the past, Disney has used actors in full body costumes (essentially those that they use in the parks for meet and greets) to handle the enchanted characters, or animatronics. But this time they went the Broadway approach: the main enchanted characters, like Lumiere, Cogsworth, and Mrs. Potts, were puppets controlled by the actor in full period dress behind them. And they were brilliant. The Beast was in complete fur and makeup, again, like they did on Broadway. Ensemble: As a whole the ensemble was genius. They are in charge of so much and they deliver. The cast moves like a ballet, orchestrating set changes and even set movement. This cast of about 25 plays triple the number of characters and they do it brilliantly. Even though there is a ton involved in putting on this show twice (sometimes three times) a night, the cast makes it look effortless. Music: The music featured in this production includes all your favorites from the original cartoon, only updated slightly for the film. For instance, “Gaston” is featured, but with the live action’s lyrics. Also on stage was “Days in the Sun,” a song original to the film. The only song I expected to hear, but strangely didn’t, was “Evermore,” Beast’s ballad and lament of losing Belle. I imagine this was due to a time restraint, as the stage version already has a total running time of 1 hour and 15 minutes, almost a half hour longer than the average DCL show. Still, I bet that would’ve been a showstopper. Special Effects: Perhaps the strongest element of this show. The special effects were out of this world – truly Broadway or West End quality. Other than the LCD walls, the cast and crew of “Beauty and the Beast” worked magic on stage. For many scenes, like the end fight between Beast and Gaston, simple staircases on wheels were used. These were managed by cast members and allowed the intense, dramatic fight sequence to happen very simply. Beast’s transformation is a tricky one, especially to be done without people knowing how. This transformation was done completely on stage. One actor. One costume. All right in front of you. I won’t give away how I think they did it – you’ll just have to see for yourself! Emotion: Some of Disney’s stage shows can be a little, dare I say, cheesy. Yes, cheesy. This one is not. This show has a fantastic balance of realistic, high-quality theatre, while still being magical and fun. From the highest of the highs, like the big energy number “Be Our Guest,” to the lowest of the lows, like Beast’s death, this show makes you feel it all. A highlight for me was when the last rose petal falls and the enchanted characters become just objects. The staging of this was brilliantly executed, evoking such emotion that several tears were shed throughout the house. And finally, when Chip is turned back into a boy, a selected member of the audience runs onstage to hug Mrs. Potts. Everyone was either crying or cheering! I was blown away by this production. Everyone who worked on this show deserves such high praise, from the cast and creative team, to the stagehands, to the stage manager. This is a tale as old as time done in a way that will remain timeless for evermore.